According to data from the Florida Department of Highway Safety and Motor Vehicles (FLHSMV), there were 374,342 traffic crashes involving 630,550 drivers in 2015. That’s more than 1,000 traffic crashes every day in the state of Florida. Also according to the FLHSMV, there were 243,316 reported injuries arising from these crashes, and 2,939 fatalities. While we hope that you never have to deal with an auto accident injury, knowing what kind of injuries are common can help you be prepared should the worst happen. The nature and severity of injuries that may be suffered can vary depending on a number of factors, such as speed, safety equipment used, types of vehicles involved in the accident, road conditions, and other factors. This type of injury is highly common in head-on or rear-end collisions where the force of impact can send your head/body forward or backwards suddenly. Especially severe crashes have been known to cause brain trauma in victims. Any accident that causes a shock to the head can result in brain trauma. These injuries are particularly difficult to deal with, as they can impair motor function, reasoning, memory retention, and may be life threatening. It’s hard to predict how brain trauma can affect you, so it’s very important to get a thorough medical examination if you suffer any form of head injury in an accident. Even with modern safety equipment, spinal injuries can still occur in any accident that’s severe enough. Just like with brain trauma injuries, spine and back injuries are incredibly dangerous, and may cause a number of permanently-debilitating conditions. Immediate medical care is necessary if you have a spinal injury, and great care has to be taken to avoid making these injuries worse. Car accidents are incredibly violent events. Your bones, muscles, and organs can be exposed to extreme amounts of force when your car is hit. Modern safety systems such as seat belts, airbags, side bags, crumple zones, and the like can help cushion the impact, but there’s only so much these systems can do to protect you. It is very common for bones to be fractured or broken during an accident. Arm, hand, skull, leg, and rib bones can all be broken on impact. When such breaks occur, internal organs may also be injured. In any accident resulting in a broken bone, seek medical treatment right away. If you notice sharp pains in your chest when you breathe, or notice swelling and excessive bruising, that could be a warning sign of a broken or fractured rib. One of the less obvious forms of injury that can occur as a result of an accident is psychological trauma. Post-Traumatic Stress Disorder (PTSD) is a possible after-effect of the shock and trauma suffered in an auto accident—particularly if the accident caused severe injury or the loss of a loved one. This could manifest in many ways. As noted by urgentcarefl.com, “flashbacks, reoccurring dreams, heightened anxiety and development of a temperament or unpredictable mood swings are all possible side effects” of crash-related psychological trauma. Getting treatment for psychological trauma is often more difficult than getting treatment for a broken bone or other physical injuries—the scars left by psychological trauma are invisible to most, and you may not even know the cause of the trauma for certain. 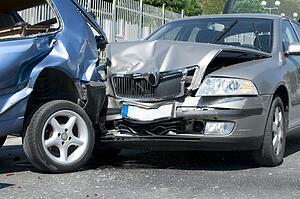 We sincerely hope that you never have to deal with an auto accident injury. The shock and pain of these injuries can seem like an unbearable burden—especially considering how such injuries can keep you from being able to work and provide for your family. As always, it’s important to be alert behind the wheel and use defensive driving to avoid the worst of an accident. However, even the best, most attentive, and well-prepared drivers may not be able to avoid an accident. If you get injured in an auto accident, be sure to seek medical attention first and foremost. Prompt medical aid can help limit the severity of an injury. After you’ve been treated, you may want to seek the help of an experienced personal injury lawyer who can help you with your injury claim.